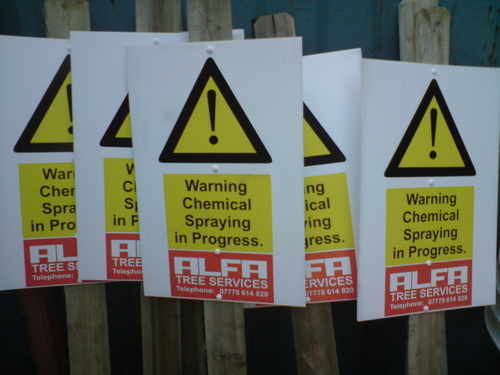 ALFA Tree Services offer a full Chemical Treatment Service inc. treating tree stumps to prevent regeneration and control & neutralisation of non naitive species i.e Rhododendron, Ragwort, Bamboo, Himalayan Balsam etc. Tree stumps are best treated when freshly cut, we drill into the depths of the stump then inject a chemical treatment before plugging the holes to prevent the chemicals being dilluted. We understand each client may have different requirements and we take the time to assess & prepare the site, whilst keeping the client fully informed of the process before any treatment work comences. This also includes any aftercare or action that maybe required such as signage of the treated area. We hold the CSCS Blue Cards & NPTC units PA1 and PA6 AW qualifications which are required by law to apply pesticides and herbicides comercially. We can offer a complete 3 year treatment programme for the stalling and eventual eradication of stubborn patches of Japenese Knotweed using specialised stem injection methods. We have previous case studies of sites where we have succesfully removed Japenese Knotweed that clients can visit or view.